Online Residency Education Management System built for Residency Directors. As a program director, gain better insight into how your residents and program are performing. With Med-Challenger, it’s easy to track key performance measures, spot trends, initiate remediation and highlight successes. Improve exam scores, pass rates, and reduce labor and chaos with quality online content, adaptive knowledge assessment & certification exam review, automatic remediation, powerful activity controls, and other time-saving tools – all in one. Let us show you how Med-Challenger can instantly benefit you – your residents – and your physician residency program – and why we’re relied on by program directors at over 250 programs across the United States and around the world. All major medical specialties supported. Education Control. Higher scores. Better pass-rates. Instant start up. Easy to use. Benefits for all. Contact us to request a free demonstration webinar or program trial. There’s a reason why so-called “Self-study Qbank” solutions stop short of providing real program outcome improvement. You need more than just questions. You need education outcome control. We give you the best of both. Assign adaptive assessments and customized exams and ensure on-time compliance. Identify resident weakness and “hot spots” of shared deficiency and use training time better. Compare performance, review assessment answers, and outperform global averages. One screen, one login for all information – from any location – on any device. You can hope – or you can know. We’re specifically aimed at group education outcome control and performance improvement, where knowledge and training systems are lacking, labor-intensive, or non-existent. Our system is 100% standalone, requiring no content management or technical set up on your end. It’s an instant, effective, affordable, and uniquely beneficial way to add new abilities to your program or augment any existing onboarding applications or training systems. Our system has improved exam pass-rates and scores roughly 14% on average and as much as 30% in some cases. Learners save up to 22% of study time. Program Managers save up to 18% of education administration time. And, yes, program directors, you need only one account login no matter how many roles you serve or how many course assets you want available in your program. In simple terms… why settle for “X,” when you need and can have “X” and “Y” and “Z” with Med-Challenger? Let us show you all you can have – and do – with Med-Challenger. We can schedule a live walkthough webinar, set up full trials, and answer any questions you may have. Education doesn’t happen without quality resources. We give you gold-standard on-demand, maintenance-free, high-yield content. Med-Challenger provides instant access to the content and testing components you need. We keep materials up-to-date, on-point, and on-demand at all times so program administrators don’t have to laboriously manage their own content resources year after year. Complete coverage. Q&A just like the American Board exam. Uniquely flexible for ITE & Initial Certification testing. We have additional subjects that augment sub-specialty training as well. variety of adjunct training subjects useful in assignments and custom exam creation. Authors are listed by course. Contact us for full content details. Our contributors are board-specialized, practicing physician educators, many of whom are active faculty at training programs. Great content doesn’t get you higher scores by itself. We give you smart, adaptive ways to train, assess & improve knowledge. 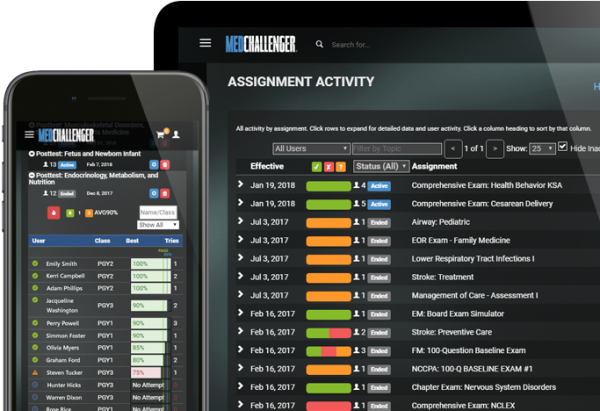 Med-Challenger gives you the largest array of intelligent assessment and remediation tools available. With adaptive learning and automatic remediation guidance, your residents learn more, faster, and score higher on exams simply by using the system, while administrators get the performance and evaluation information they need, on one screen, instantly. Ultimately, we improve outcomes for everyone – residents, faculty, administrators, and your program. Use our intelligent assessments or build your own. Adaptive learning does the heavy lifting – automatically. 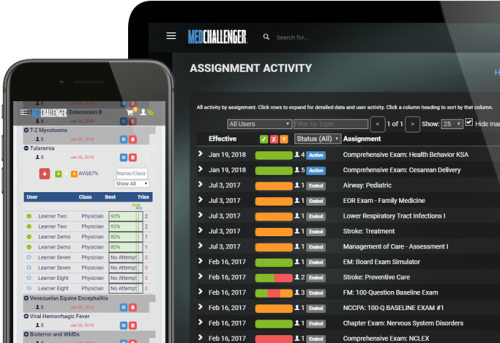 Med-Challenger provides out-of-the-box adaptive, board exam simulations, chapter-based exams, and a Custom Exam Builder so you have flexibility to achieve any type of training objective or measurement. Note: All Items are Assignable. 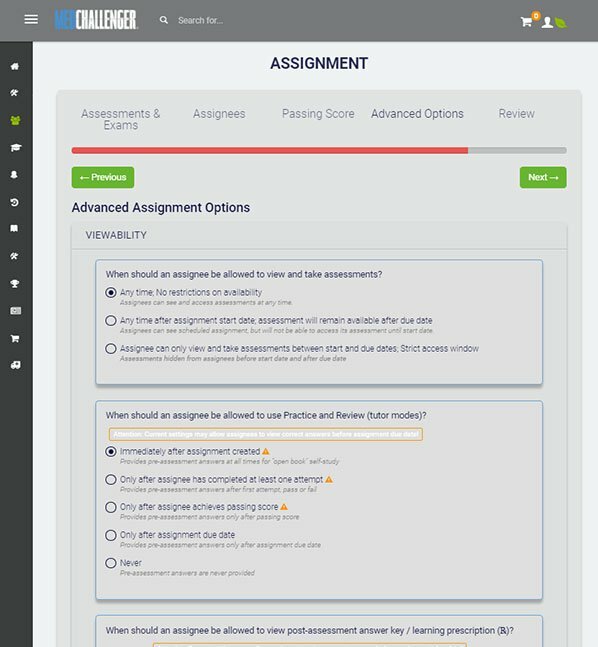 When assessments or topic-based materials are used with our Assignment Manager, there’s no better way to assess, remediate, and drive exam preparation or improve knowledge quality. This intelligent assessment issues a board exam simulation remembers any questions missed by a user and prioritized those questions from re-issue in subsequent simulation usage. By routinely assigning adaptive exams to a student, our platform automatically ensures all materials are seen, tried, and mastered, without repeats of already mastered content. Adaptive chapter exams are useful in ITE & initial certification testing. Chapter exams function similarly to the larger comprehensive simulations, but only use questions from each chapter respectively. Our courses, at their core, feature topic-based learning segments that cover all key points in all specific topics in the board exam blueprint. We provide Practice (unscored trials) and Review (read-friendly answer reviews) modes as well as a scored topic Assessment. Together this “programmed learning” progression is a proven method of enhancing retention of the material. Build Your Own Exams - and Assign Them too! Our Custom Exam Builder provides all the flexibility medical educators require. Pick questions from our question banks, allocate the number of questions served by your exam – even set allocations by section. You can set a number of parameters for a variety of testing applications – from self-study, to straight testing, and more. What’s more, you can save your custom builds and assign them with our Assignments Manager. No one else gives you this ability. Pre-built custom exams – such as a 100-question “baseline knowledge” exam in each specialty – give program directors additional “out of the box” special case testing options. “Baseline exam” formats, for example, are useful for initial apples-to-apples testing (where everyone assigned gets the same questions) to help gauge incoming student knowledge on a standard. These pre-built custom exam designs are also usable as templates in custom exam creation. That way you can load up our expert-curated templates in our Custom Exam Builder as a starting point and change out or add any Q&A as you like, then save and assign your own special variants. Gets double done for you. After residents take an adaptive assessment, we provide a “learning prescription” that informs learners of weak areas of knowledge and presents a self-improvement path to “deeper dives” automatically. Assessment details showing questions missed, what answers were given, and full answer explanations are accessible by residents, but also by program administrators. Our unique “Hot Spots” feature shows you what questions were missed by multiple assignees. Knowing shared areas of difficulty helps program directors aim their group review efforts. Residents can initiate a “deeper dive” in any area where questions were missed. This allows for self-enrichment beyond the scope of the questions in the initial assessment. Essentially, our system of assessment and feedback provides a “double-cycle” of educational benefit. Residents will have been able to self-remediate themselves without further instruction. Residents improve faster – without your valuable time. Great content and testing features work only with reliable activity and compliance. 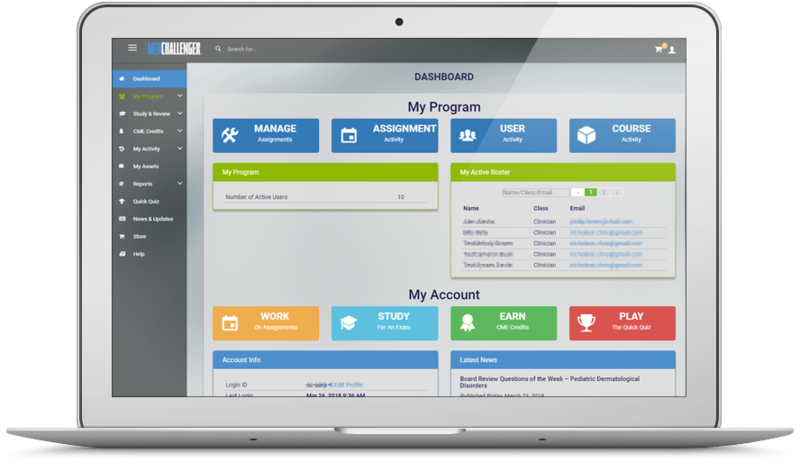 We give you control over learners, activities, schedules & outcomes. No matter how many residents or how many locations you manage, with Med-Challenger you’ll enjoy control over every learner’s activities from a single screen. Assign customized activities, improve compliance, and react faster with assignments, shared calendaring, and performance analysis. Make it happen. Watch it happen. Assign activities, set special assignment workflows, and track performance across your group – in a snap. Easy to use Assignment Wizard makes assignment creation easy. Select a course. Select elements for assignment – from exam simulations to chapter exams to topic-based tests and more. Select your assignees from automatic lists by individual or by class designation. Set a passing score for the assignment and more. 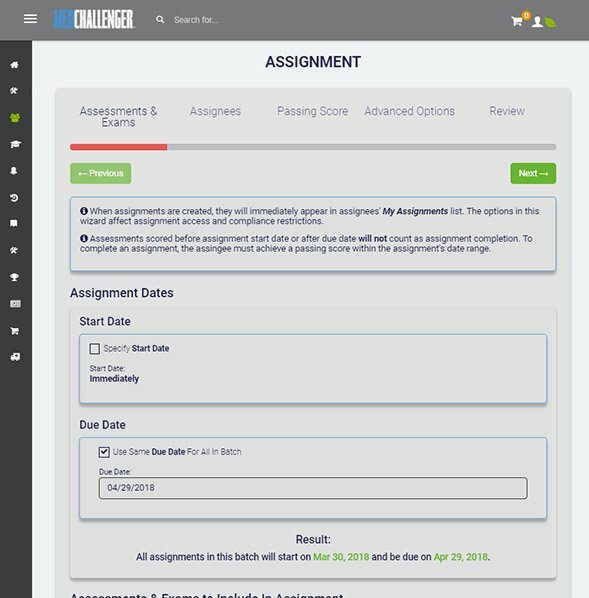 Once complete assignments will display on your assignment dashboard, calendars and more. Program Directors can utilize calendar and gantt chart views to lay out a series of assigned activities, manage timelines, and better avoid trainee overloads. 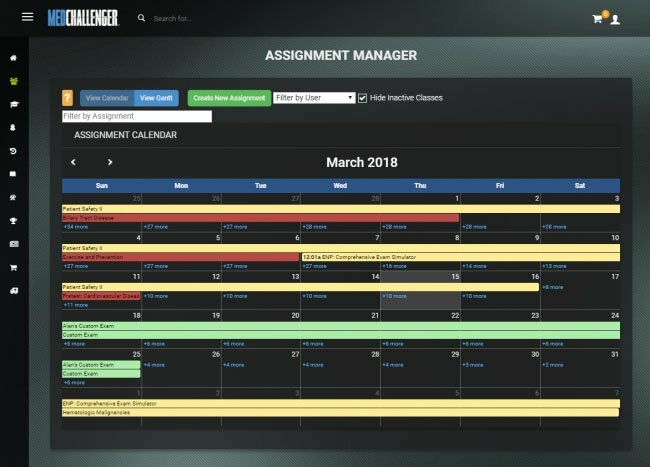 If changes are needed, you can modify assignments on the fly. Your assignees will be able to see their assignments on their account dashboards for on-time compliance. Set passing scores and behaviors of what is allowed and/or seen before, during, and after an assigned assessment is completed. Provide free-study materials or ratchet things down to exam-only activities. Your assignees will be able to see their assignments on their account dashboards for on-time compliance. Modify assignments on the fly and send notifications to keep your learners informed of expectations. Easy to use Assignment Wizard makes mapping program objectives easy. Quickly monitor completion and performance data of each assignment. Group assignments render all assignee performance data in one spot for quick comparisons and investigation of answers given, “hot spots” of shared deficiency, and global averages. Produce score report data by data range, learner classes and more. Export data to PDF. Quickly see what assignments are complete or not. See who’s not complied – and get them going. See and compare scores of assignees within an assignments. Export data to PDF. Report on scores, activity, and performance by individual, class, program. Export data to PDF. Compliance reports help groups understand other MOC compliance needs across their group. Export data to PDF. Application on-screen details provide a wealth of reporting metrics as well. Print screens or export PDFs via Reports suite. We’ll get you rolling & keep you rolling. Let our expert support staff train the trainer. We’ll get your program and user accounts set up in no time. You can start using your program immediately. We can schedule live training webinars for you or your group at your convenience to explain features, use-case tactics, and best practices. we provide 24/7 online support resources on our searchable support site. Find answers to FAQs or step-by-step user guides anytime. For everything else that comes up. We’ll be there for you. Troubleshooting, account change assistance, and general know-how is never far away. Preparedness and expecting the unexpected are two important lessons I learned from my residency program. Challenger’s question bank is filled with more case-based presentations than you will ever see in live training, giving you that extra advantage to ensure you excel on your boards P. Griner, M.D. Challenger’s Academic Training Platform gives program directors the ability to monitor each resident’s progress and quickly identify their areas of strength and weakness. They can then adjust what assignments are sent to each resident according to the data. What an amazing way to interact with residents and create a personal online learning experience! I wish this existed when I was doing my residency. P. Griner, M.D.